The low-carb donut you have been waiting for. I recently discovered that I live exactly 5.5 miles from one of Honeyville Farms four locations. If you are new to the Paleo baking world, you want as finely ground an almond flour as possible to avoid dense grain-free baked goods. Honeyville blanched almond flour is perfect, whereas brands like Bob’s Red Mill are a bit too coarse. I love most all of Bob’s products but the almond flour is so crumbly that the package should read “almond meal.” I now refuse to buy the stuff based on my macaron-making experiences alone. It’s still winter (thanks, Arizona) and it’s actually cold right now. So that means continued liberal uses of cinnamon and freshly ground nutmeg. 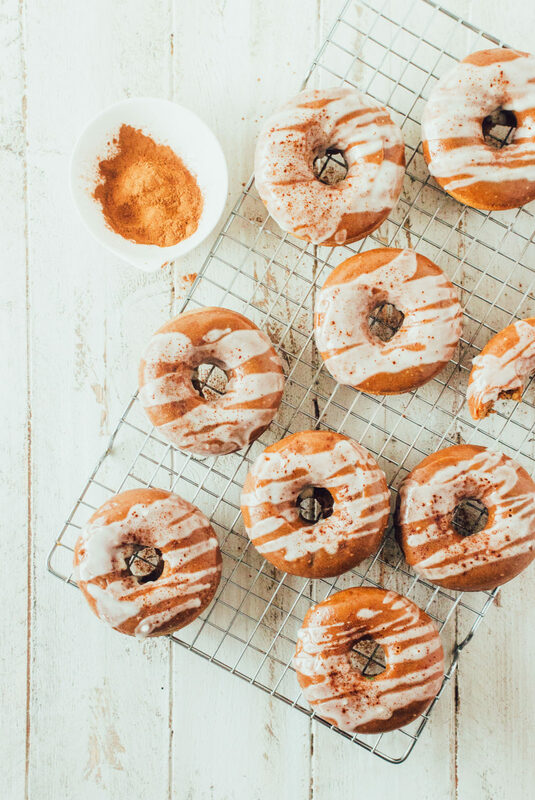 These cinnamon roll donuts fall into the cake donut category but they are going to be better than any cake donut you’ve had from the donut shop. They set up light and fluffy and ridiculously moist. Not to mention, each donut has 11 grams of protein. Even more if you count the chopped almonds garnish. Crazy, right?! The amazing protein to carb ratio will help keep the blood sugar from spiking as much. No sugar high, no sugar crash. Part of the protein contribution is from a sweet & creamy maple almond glaze. I LOVE this almond glaze recipe. Amazingly, it behaves exactly like a glaze (thick and creamy and sets up stiff) without needing any powdered sugar or starches to thicken. It’s great on these donuts but you could most definitely make extra and keep it in your fridge for your next baked goods or even just to take a spoonful of in the afternoon (or morning or evening or all of the above) when you need a pick-me-up. Edit 6/3/2016: I’ve revamped this recipe to yield a fluffier donut! (just the addition of just a little tapioca starch and lowering of the almond flour). With a few more years of Paleo baking under my belt since I first made these, I’ve found that when grain-free baked goods include almond flour, they almost always benefit from a little added starch. Additionally, due to the Mr. & my long-running lower carb diet, I wanted to make these accessible to those low carbers like us. So below, you’ll find two variations of the recipe! They both taste amazing and I honestly couldn’t pick out one from the other. You can see them side by side in the new picture above (with the additional coconut butter swirl). *On choosing a donut pan….when making this recipe originally, I used antique donut molds that worked terribly as far as “non-stick” goes. I don’t recommend them. I then moved to this Wilson pan but found the cavities aren’t quite deep enough to give a good rise (important with grain-free baked goods). So I’ve since moved to this silicone donut mold and LOVE IT. It has deep cavities and a great naturally nonstick surface so you get a fluffy donut that releases easily! Combine the butter and honey in a small saucepan and melt over low heat. Set aside to cool. In the bowl of a stand mixer fitted with the paddle attachment, beat eggs and vanilla on medium until light and fluffy. Turn the mixer down to low and slowly drizzle cooled butter/honey mixture in. Add the almond flour, tapioca starch, apple cider vinegar, baking powder, baking soda, cinnamon, cloves, nutmeg, and salt. Mix on medium speed until mixture is very well-combined. The resulting batter will be a thick paste, like brownie batter. Scoop the batter into a large ziplock bag. Squeeze the batter into one corner opposite the ziplock seal. Twist it tight and snip 1/2″ off of the corner of the bag holding the dough. Pipe the dough into the donut cavities to 2/3 of the way full. Bake 15-18 minutes (rotating the pan halfway through) until slightly golden and a toothpick comes out clean. Allow to cool for 10 minutes in the pan before inverting onto a cooling rack. Cool slightly before topping with the Maple Almond Glaze and chopped almonds, as desired. Combine the butter and sweetener in a small saucepan and melt over low heat. Set aside to cool. In the bowl of a stand mixer fitted with the paddle attachment, beat eggs and vanilla on medium until light and fluffy. Turn the mixer down to low and slowly drizzle cooled butter/honey mixture in. Add the almond flour, apple cider vinegar, baking powder, baking soda, cinnamon, cloves, nutmeg, and salt. Mix on medium speed until mixture is very well-combined. The resulting batter will be a thick paste, like brownie batter. **If stevia (liquid or powder) is your low-carb sweetener of choice, add the almond flour 1/4 cup at a time until the batter resembles brownie batter. I have no made it this way but am sure that with the lower volume of sweetener needed with stevia, you won’t need the full 1 1/2 cup almond flour listed here. Add the almond butter, maple syrup, vanilla, butter, and sea salt to a small saucepan. Heat over medium low heat, stirring continuously until smooth. Depending on the thickness of the almond butter used, you may want to water down the glaze with 1-2 teaspoons of water. 🙂 I have some really old molds I got from an antique store. Not nonstick and they are a bit of a pain to use. But I’ve seen these recommended by many bloggers and they look highly rated: http://amzn.to/1LF2PhE. Good luck! I bought my donut pan at Micheal’s Arts and Craft store. It costs $10, but if you have a coupon, you can get it as cheap as $5. It works awesome!